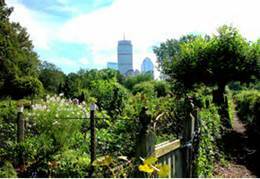 Fenway Victory Garden Tour July 27th! Here’s a great opportunity to see some wonderful city garden spaces! On Saturday, July 27th from 2 – 5pm, more than 25 Fenway Victory gardeners will open their gates to visitors. 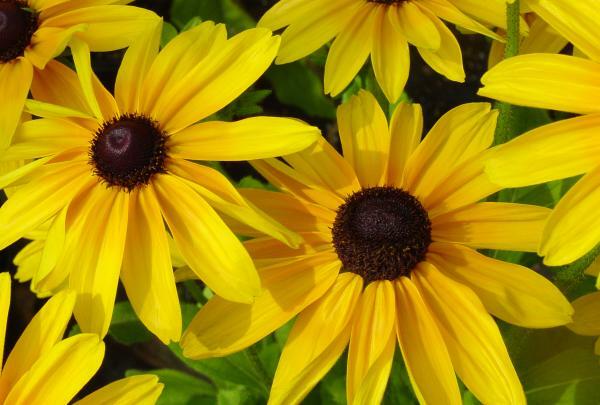 Come view beautiful flower and vegetable gardens, picnic in the meadow, play bocce, learn new gardening tips and get inspired! Sounds like great fun! There will be a sprinkler for kids of all ages to run through…come on down! The gardens are located in Boston. A map will be available at the flagpole. Rain Date July 28th. 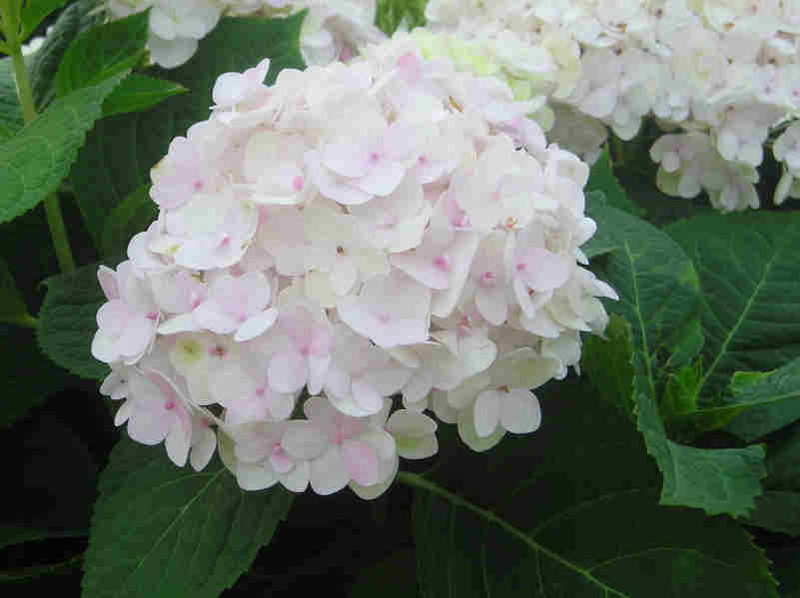 For more information, call 617-267-6650 or visit www.fenwayvictorygardens.com. First of several posts. Lots to share! The Seaport World Trade Center was abuzz yesterday morning with gardeners putting the finishing touches on their Flower Show displays. The show opens today, March 13. I dodged a forklift, piles of soil and a Zipcar backing into place but the activity did not interfere with my sense of enchantment. 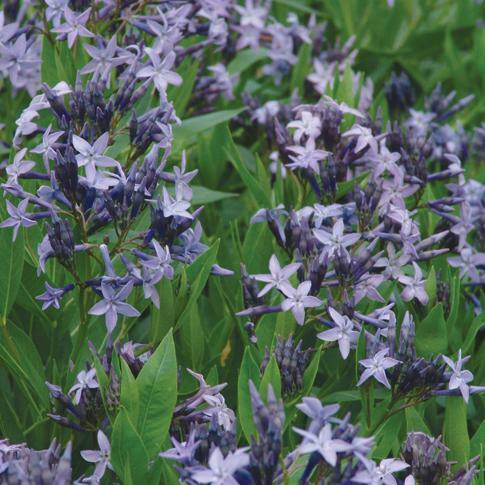 The garden displays this year are rich – in color, design and size. 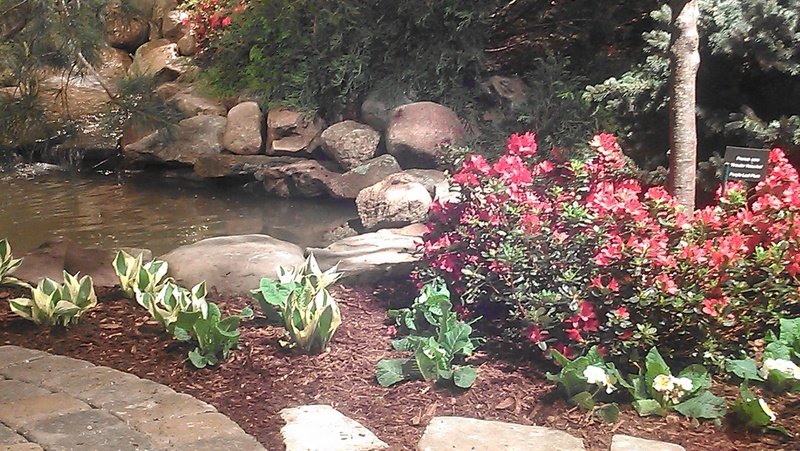 Beautiful flowers and trees are nestled along stone walls, patio spaces and above moon gates. The sound of water is everwhere – in falls, pools, fountains and spouts. There are parrots, hens, a rooster and a pair of sleek grey birds that look like small emus. And there are plenty of hidden flower delights if you look keenly, like fairy houses near Hobbit holes and gentle beds of helleborus. There are a several small displays. The window gardens in the back of the main hall are delightful as is the Massachusetts Horticultural’s old-time flower display, complete with wash board and clothes on a line. Overall, every display is evokes a smile and a deep inhale. 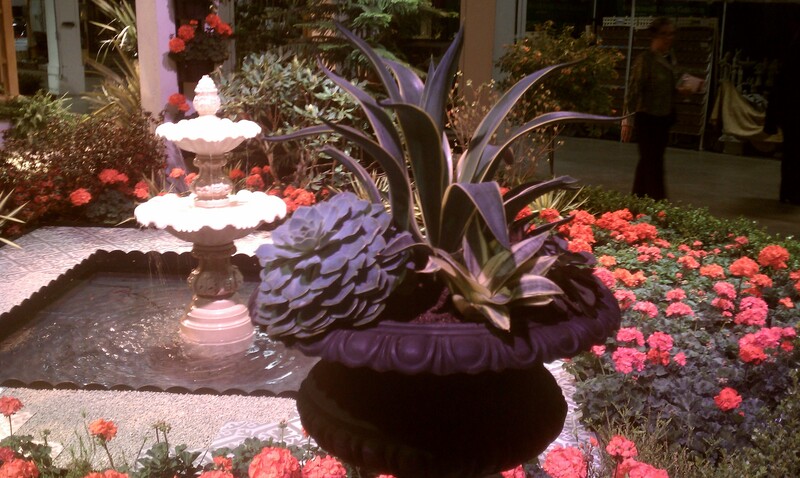 The Show’s first display as you enter the hall shows garden entertainment at its finest. It’s a lush, multi-section outdoor patio with a man-sized BBQ grill and stone bar with table seating for four and more at the bar. It took me a minute to take in and appreciate the surrounding garden but there’s no denying I’d love to have this look in my back yard (if I had one). The BBQ space flows to a raised covered patio section with comfy chairs, a fireplace and two waterfall chutes splashing into a pool. The chutes really got my attention. Overall, the display and its beautiful and lavish flowers and trees set the mood for a perfect summer evening. 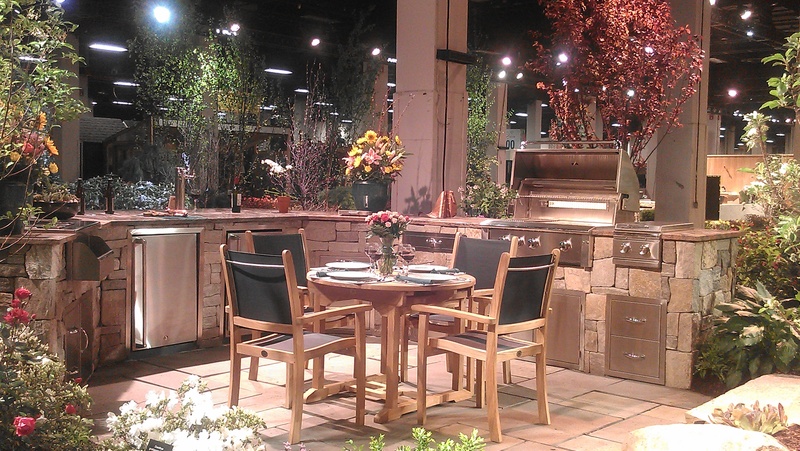 One of my favorite displays at the Show is another outdoor patio surrounded by lush, aromatic plants. Designed by Maria at Interiors by MS, the focal point is a vertical garden of herbs and gerani ums with a water feature of four simple copper spouts splashing into a large pool. 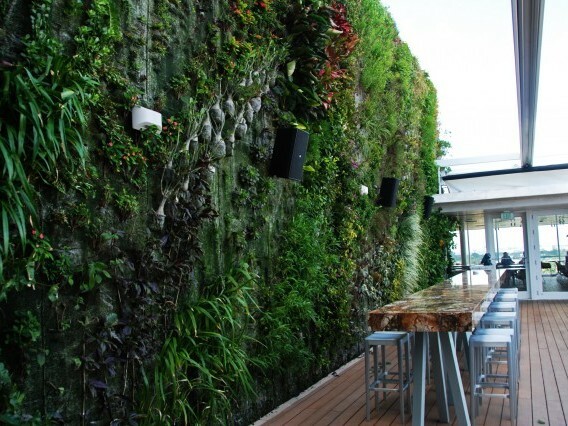 Maria told me that a vertical garden can reduce the temperature around it by 15 – 20 degrees. Comfortable, earth-toned furniture sit low and humble under a stained-glass pergola. There is a pleasing, subtle aromas coming from the lavender, mint, roses and more that ring the relaxed space. I could so live in this space. That’s it for now. I’ll share more pictures and details in my next post. 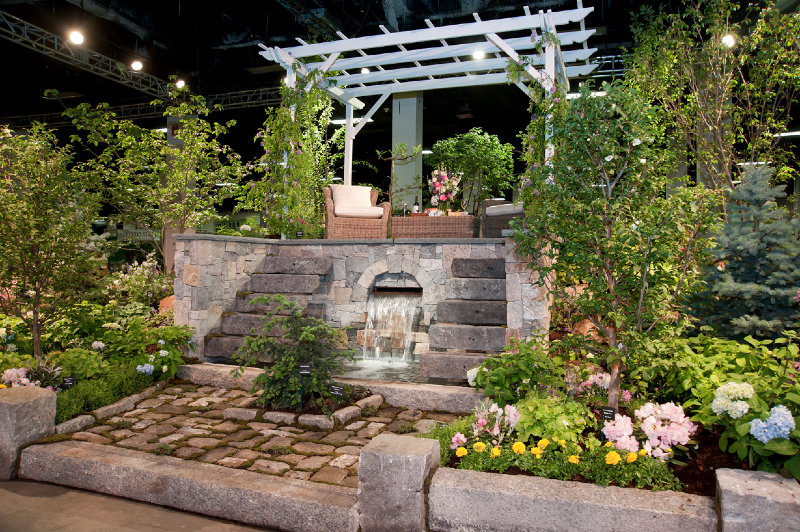 This year’s Boston Flower Show delivers on the sights and sounds of Spring. It opens today, March 13 and runs through Sunday, March 17. Go if you can! 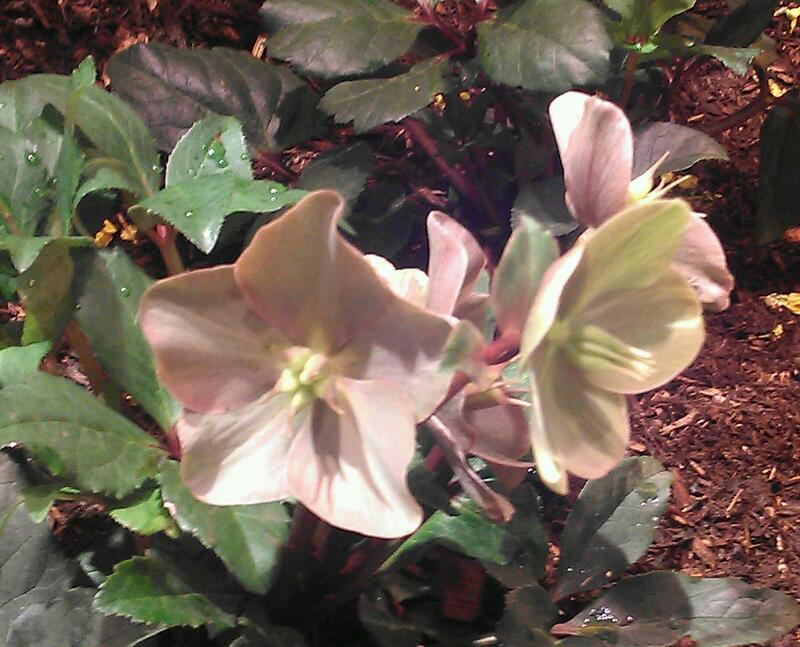 Boston Flower Show Opens This Week! 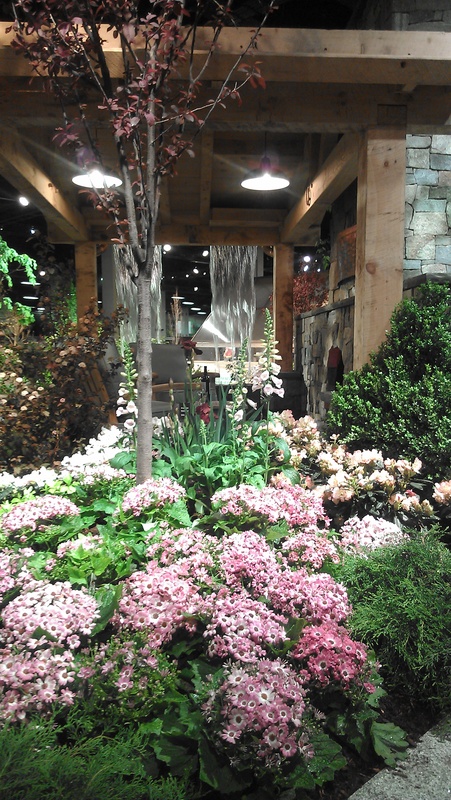 It’s almost time for the Boston Flower & Garden Show! I must admit I get so excited when the show opens. It’s like going to Oz. First it’s that lovely, earthy smell of mulch as you walk through the doors. 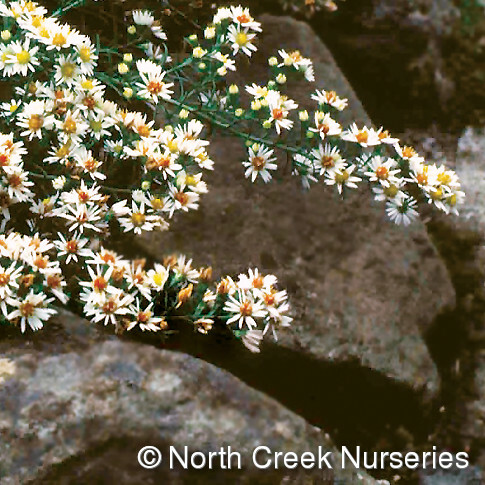 Then the vivid carpets of color from flowers in full bloom bunched close, overflowing from pots, arranged neatly. Somewhere close by water is splashing from a fountain or w aterfall. And the people are abuzz – walking, talking, oohing, aahhing and yes, shopping. The show always delivers inspiration and gets me all jazzed with new ideas for my own garden. 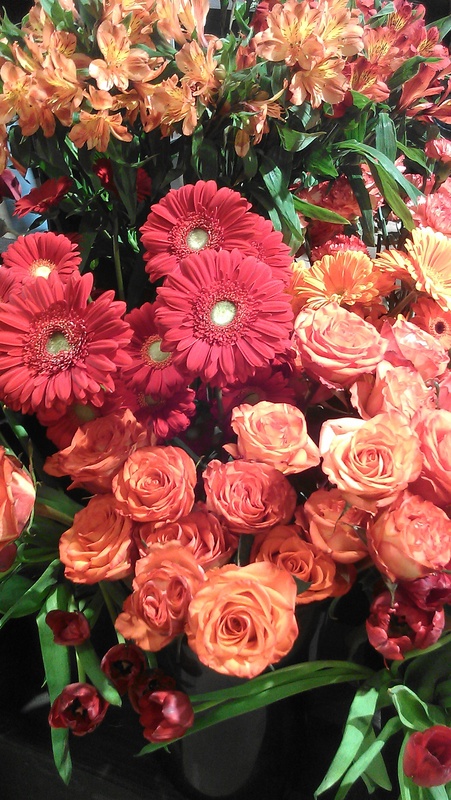 The Bost on Flower Show returns to the Seaport World Trade Center in Boston this week! It opens to the winter-weary public on Wednesday, March 13 and runs through Sunday, March 17, 2013. This year’s theme is ‘Seeds of Change’ and will showcase new plants, methods and materials to increase the beauty, bounty and the ecological friendliness of gardens and outdoor spaces. Since I’m a member of the Garden Writers of America, I plan to visit the show on March 12th during the Media tour. I’ll write a ‘first look’ blog post with photos later that day. Just for City Garden Ideas readers like you! Tickets to the show are $20 for adults and $10 for children. To buy tickets, click here. Hello all and happy 2013! Are you familiar with vertical gardening? 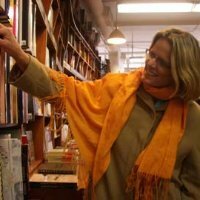 The practice has been around for decades but interest in it has been growing for the past several years. 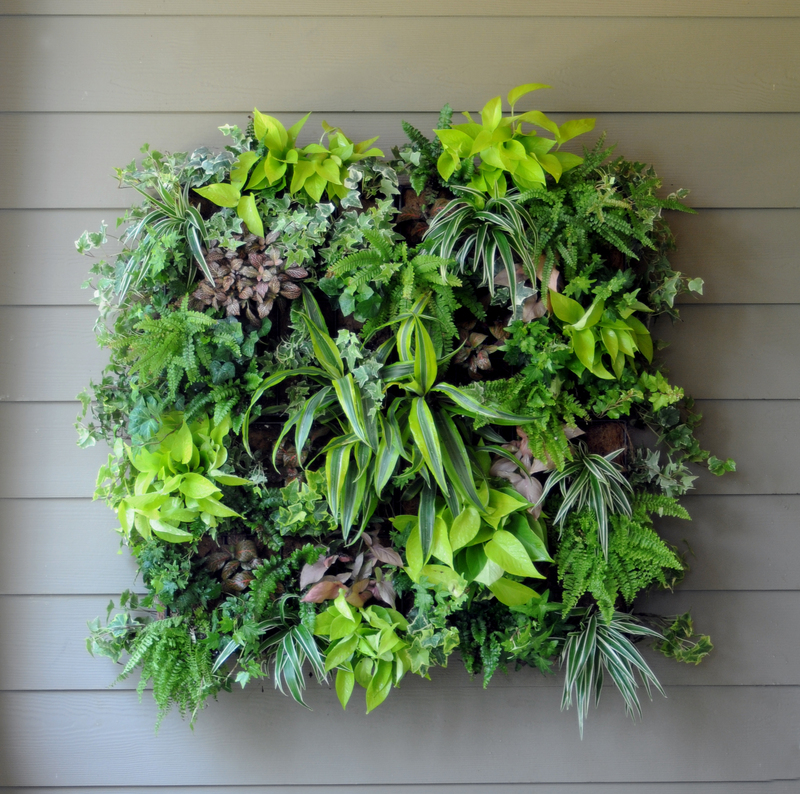 Vertical gardening differs from walls of ivy. We’re talking about self sufficient living walls of plants that get their water and nutrients within a vertical structure and not from the ground. I’ve loved the idea of vertical gardening for years… even before I knew it had that name. Perhaps it’s because Boston has so many flat brick walls facing the alleys in the Back Bay where I live. I always imagined something beautiful could be done with these blank canvasses. Wouldn’t it be great to see the walls flowering in the summer with morning glories, mandevillas or hibiscus? Ah, what a delightful sight that would be! 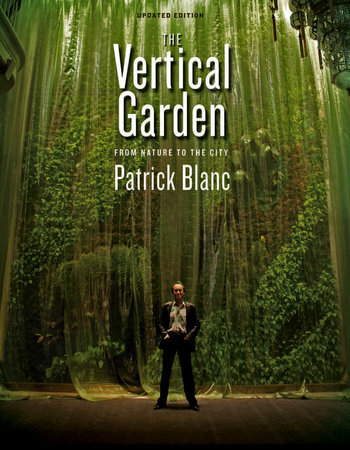 So when I read about Patrick Blanc, the inventor of the Vertical Garden, speaking on April 24th at the Museum of Fine Arts in Boston called “The Vertical Garden: Biological Design and Urban Architecture”, I immediately bought tickets to attend. I also bought another two tickets to give away to one lucky City Garden Ideas reader who is interested in vertical gardens. 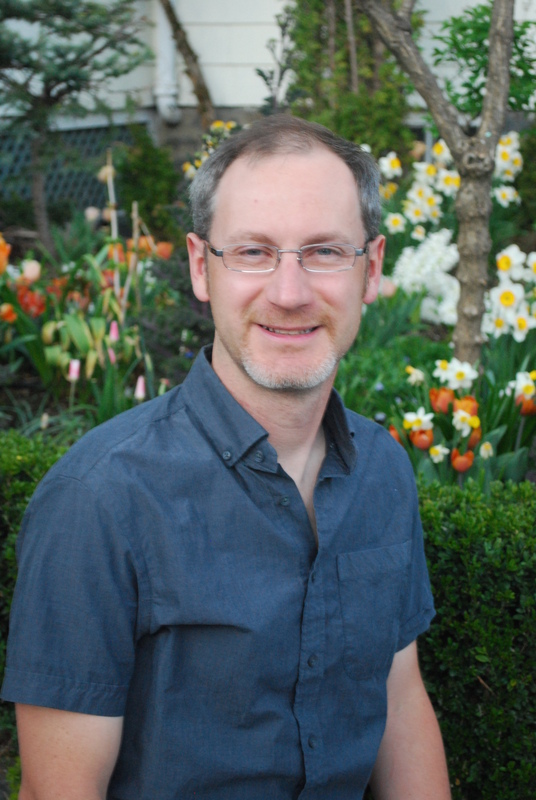 Comment on this post by March 15th and tell me – in 100 words or less – why you want to attend this vertical gardening lecture. Let me know why you want to learn more. Patrick Blanc says he’ll reveal ‘his methods for transforming naked walls with nature.” This I have to see! Hope you’ll enter to win or just buy tickets through the MFA. And remember, Spring begins March 20th and it’s getting closer every day! One entry per person. Entries will be reviewed and one winner will be chosen on March 22nd. The decision of the judge (that’s me) is final.